More on the Touchstone Whisper Lift II Pro Advanced TV Lift for Screens up to 60 inches (Black) 23401 below. The new Whisper Lift II PRO Advanced TV Lift is Touchstone's advanced lift is constructed from durable steel for unmatched strength and stability and is powered by a whisper quiet 24V motor. 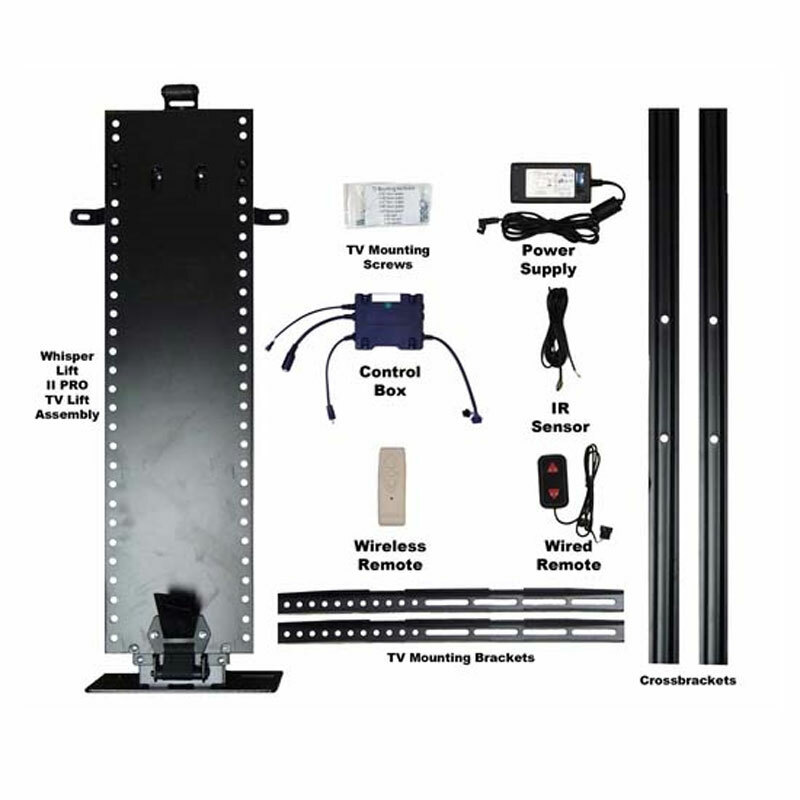 The Whisper Lift II PRO Advanced TV Lift is equipped to provide the power and durability you need in your TV lift mechanism, while providing advanced features like 12v trigger, IR capability, and ability to set the lift height. The Whisper Lift II PRO Advanced TV Lift measures 32" H x 10" W x 7" D (including brackets that connect to back of TV) and lifts to a full height of 65" in under 30 seconds. 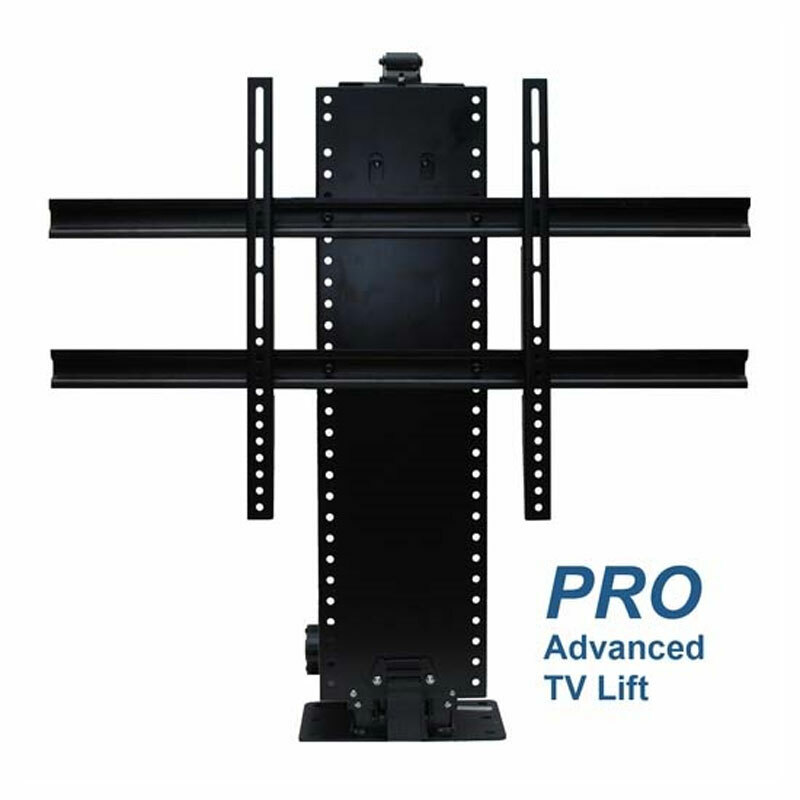 Designed to fit flat screen TV's up to 60", this lift holds televisions up to 100 lbs, with a lift capacity of 120 lbs. Touchstone's Universal Quick Connect system makes it easy to install any flat screen TV in just minutes. A universal hardware kit comes with each TV lift kit which includes bolts and machine screws to accommodate most brands and models of flat screen TVs. 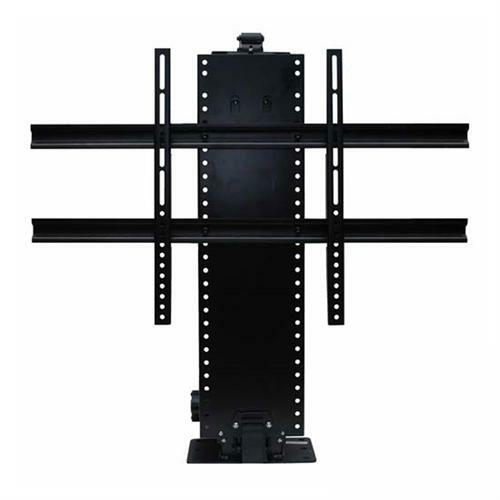 The Whisper Lift II PRO Advanced TV Lift features a unique mounting mechanism which fastens your flat screen TV to the Quick Connect Bracket for guaranteed safety and security. While most Whisper Lifts are installed within Touchstone TV Lift Cabinets to lift your flat screen upward, these lifts can also be mounted to your ceiling or wall and drop your flat screen downward, as shown here. The Whisper Lift II PRO Advanced TV Lift operates by using a single piston actuator in an enclosed system for completely safe operation with virtually zero wear and tear. The steel external casing of the lift provides added protection for the lift internal parts, which keeps it clean and free of dirt and any debris. The Whisper Lift II PRO Advanced TV Lift is the highest quality television lift on the market. Our customers adore this product. It's the most durable, quiet, and reliable lift mechanism out there despite its low price. You may find other more expensive lifts from other brands, but do not mistake high mark ups for high quality: the Touchstone Whisper Lift II PRO Advanced TV Lift is the top of the line TV lift. This lift's high quality makes it extremely reliable, as well. You will have to replace your flat screen television long before you ever have to replace this lift: the Whisper Lift II PRO Advanced TV Lift is built to last. You can upgrade the Whisper Lift II PRO Advanced TV Lift with Touchstone's new add-on component shelf to store your cable box, game system, DVD player, and other components for only $89. 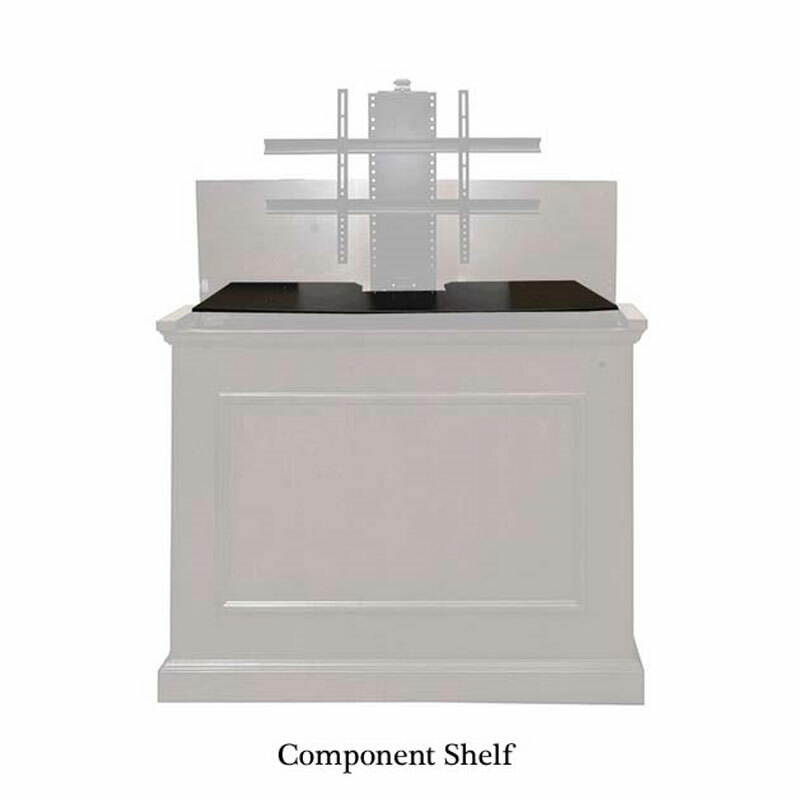 The add-on component shelf attaches to the TV lift system directly below the flat screen TV and raises or lowers into the cabinet along with you TV when remotely activated. The shelf provides an area of 16" W x 9" D on both the left and right side to fit a wide variety of multimedia components. 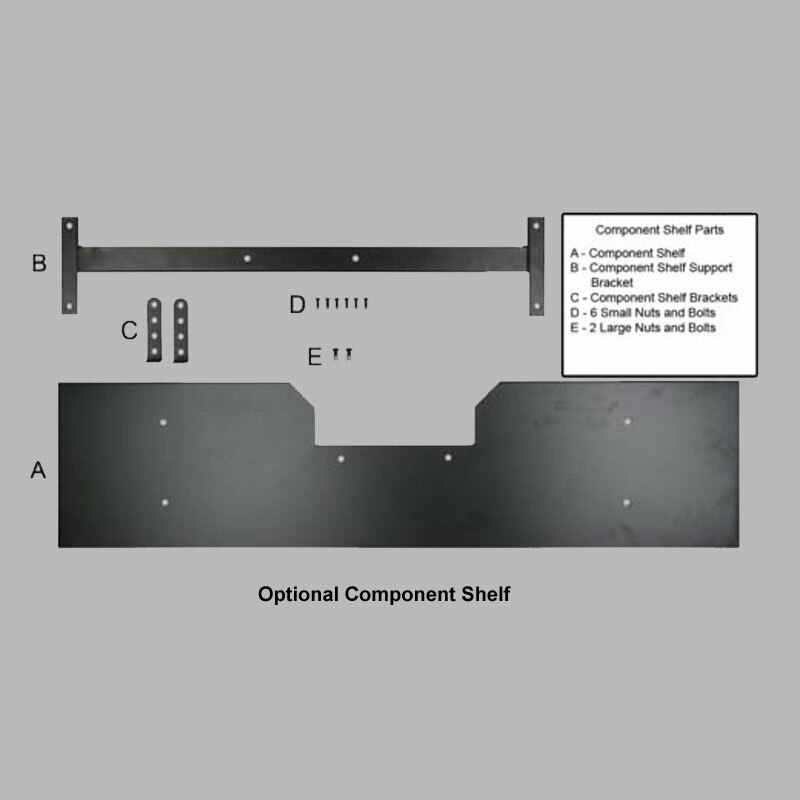 Just select the add-on component shelf option when placing your order. Over the past few years, we have had many requests of customers looking for a Drop-Down TV lift. The versatility of the Whisper Lift II PRO Advanced TV Lift allows for the lift to be used both in cabinets, as well in a drop-down application. Want to impress your guests? Just press the button on the wireless remote control and watch the Whisper Lift II PRO Advanced TV Lift drop out of the ceiling creating an instant movie theater. When you are done, just raise the TV back into the ceiling and no one will even notice there was a TV in the room. The Whisper Lift II PRO Advanced TV Lift is tested for use in a drop-down application with TVs under 75 lbs, perfect for TVs under 55 inches. Click Here for a video of the Whisper Lift II being used in a drop down application.